An example of where a Pathway might be particularly useful, you can create a Pathway for a each of the various job positions in your organization. Once created, you can then define all of the various training that that position requires as part of their job function. Reporting is now simplified as you can run a single report to identify any deficiencies by position. 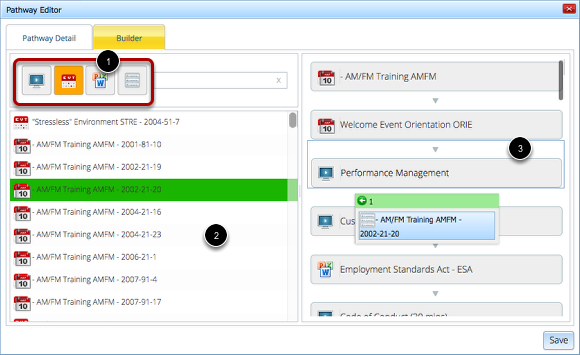 The Pathway Manager was designed to be a simple as possible and to be consistent with those managers for Events and Communications. #1: By clicking the addition (+) icon, you can create a new Pathway. 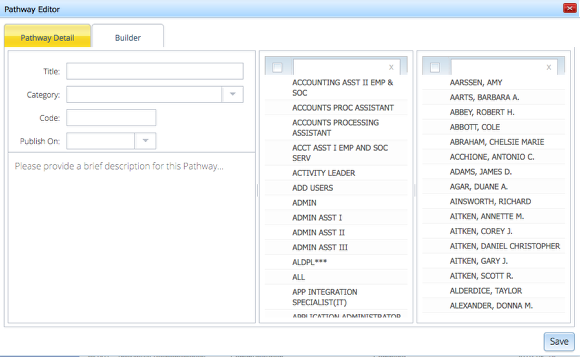 #2: For convenience, you may duplicate any existing Pathway defined in the system. #3: You may delete any number of selected Pathway items in the grid below. #4: Once created, you can edit and make any number of changes to an existing Pathway. When adding or editing an existing pathway, you have many attributes available to you to define and tailor your pathway to suit your needs. Who should this Pathway be available to? By selecting one or more of your available Users or Groups, you are indicating which users have access to your Pathway. 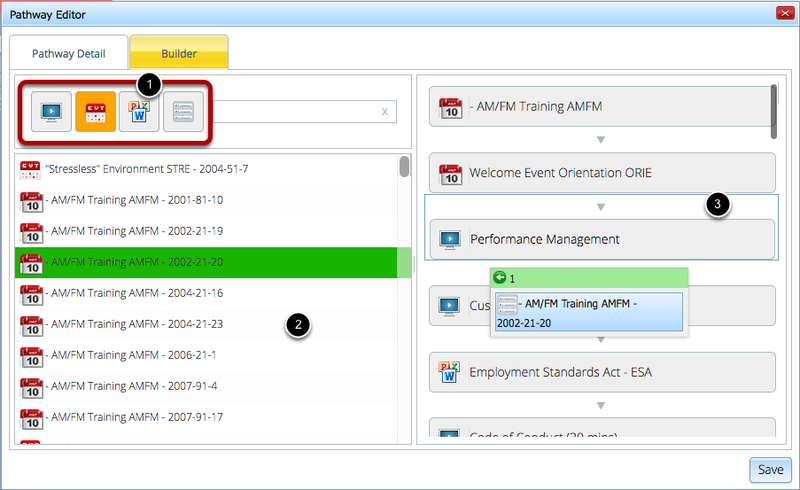 New groups can be created using the Group Manager. The panel to the left #1 represents all of the Groups available and the panel to the right #2 contains all of the active Users available in the system. At any point, you can search for a User or Grid by interacting with the search box at the top of each grid #3. The Builder is used to define which of the existing Courses, Communications, Events, or even other Pathways this item is made up of. By toggling the various module types #1, you can pull up a list of all those items #2 that correspond to this selection. You can then drag the item from the left #2 over to the right panel #3 if you would like this item made up of your Pathway.